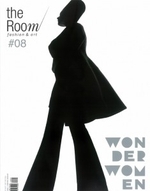 The Room Magazine, established in 2004, was designed to represent Hungarian culture in the world. Unique of its kind - even on the international market - the magazine wishes to provide milieu for talented Hungarian artists, fashion designers and photographers. The Room symbolizes a creative space that is hosting, collaborating and representing at the same time. This spacious „room” is inhabited by people whose major means of expression is creativity, whose common language is work and whose strongest weapon is commitment.